It’s one of the worst feelings when your child is sick; however, no matter if you’re dealing with a fever or an earache, it may be time to schedule a sick child visit. When you call our West Jordan office, we’ll listen to your issues and let you know whether your child should be seen by one of our pediatricians. If your child is ill, our office will do it’s best to ensure that your child sees one of our providers. Appointments for same-day sick visits can be scheduled as soon as our office opens at 8 am. We are closed on Sundays. 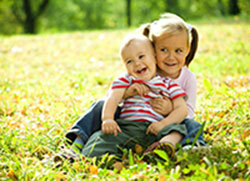 If your primary doctor isn’t available, another pediatrician in our office may see your child. Unlike a well-child visit, the main purpose of a sick child visit is to address and treat a specific problem such as a sore throat, fever, or vomiting. At Southwest Children’s Clinic, we are committed to providing your child with quick, quality care when they need it most. We even offer both sick and well-waiting rooms, to contain infectious illnesses so germs aren’t spread between patients. If your child is sick and you think it’s time to schedule a sick child visit, call our West Jordan, UT office right away at (801) 563-1975.